I’m Katrina and I’m working with Civic Engineers on all aspects of their Marketing and Communications. I’ve worked in the Communications industry for over 15 years for a variety of organisations including Marketing Agencies, Premiership Football Clubs, Fire & Rescue Services, to name but a few. I love really getting to know a company and helping them find the best ways to communicate with the people they need to. Outside of work, I have my hands full looking after my two kids but when I can I enjoy yoga and pilates and holidays to Cornwall. I also have a complete obsession with music that won’t let me let go of my 900 strong CD collection! One morning a week I also teach Community Baby Massage classes to support Mums and babies in my local area, over 300 have attended my classes since I started 6 years ago. 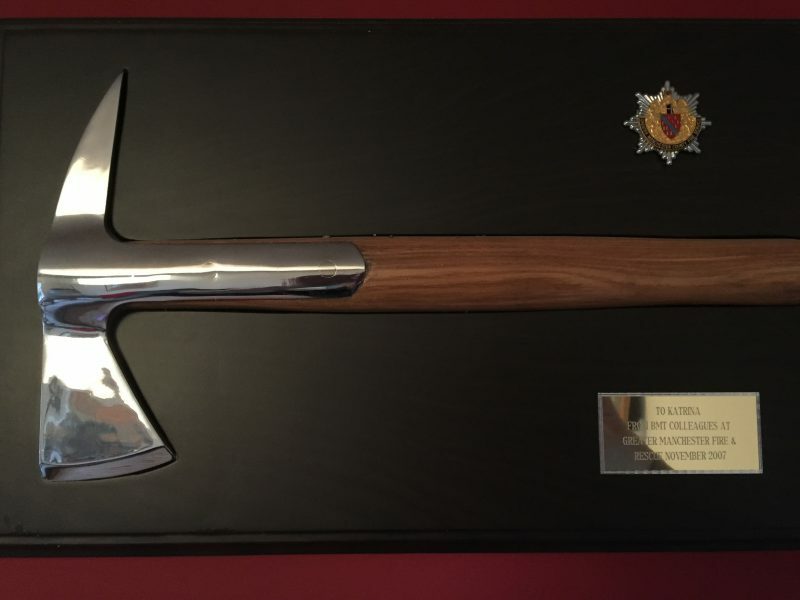 This axe is really unique and special to me as I was awarded it when I left my job at Greater Manchester Fire & Rescue Service and it is only usually given to uniformed officers. It was presented to me in recognition of the work I did calling for a change in the law to protect Emergency Service Workers from attacks by the public. Amazingly all the hard work paid off and in 2006 the Emergency Service Workers Act was brought into force.